Future Technology and Economics: Automation and Robots: Fast Food, McDonalds, Starbucks, etc. Automation and Robots: Fast Food, McDonalds, Starbucks, etc. Millions of people hold low-wage, often part-time jobs in the fast food industry. Historically, low wages, few benefits and a high turnover rate have helped to make fast food openings relatively abundant. These jobs, together with other low-skill positions in retail, provide a kind of safety net for workers with few other options. In the current economic environment, these jobs are, of course, much harder to get. McDonald's recent high-profile initiative to hire 50,000 new workers resulted in over a million applications---numbers that give McDonald's a lower acceptance rate than Harvard. What about the future? Most forecasts assume that the fast food industry will continue to be a significant job creator. The Bureau of Labor Statistics ranks food preparation as one of the top four fastest-growing occupations, and that trend is expected to continue at least through 2018. Efficiency is paramount at Kura: absent are the traditional sushi chefs and their painstaking attention to detail. In their place are sushi-making robots and an emphasis on efficiency. Absent, too, are the exorbitant prices of conventional sushi restaurants. At a Kura, a sushi plate goes for 100 yen, or about $1.22. Such measures are helping Kura stay afloat even though the country’s once-profligate diners have tightened their belts in response to two decades of little economic growth and stagnant wages. McDonald's has already announced plans to install touch-screen ordering systems in over 7000 European locations. To me, it is not difficult to imagine many of the ideas being utilized at Kura eventually being deployed throughout the fast food and beverage industries. If automated preparation and off-site store management work for sushi, then why not for burgers or lattes? One important thing to take away from the sushi story is the way in which a stagnant economy can be a driving force behind increased automation. Almost any type of restaurant food is a discretionary purchase: if the price is too high, people can and will refuse to buy. That presents a real problem if---as is the case now---businesses are seeing significant increases in the price of the food commodities they must purchase. For a business that is squeezed between rising input prices and tepid demand, investment in labor-saving technology can represent one of the few viable paths to continued profitability. If jobs in the fast food industry start to disappear, or even if the rate of job growth slows significantly, the implications for the workers that depend on these jobs of last resort will be dire. There may be few other alternatives for workers at that skill level, especially since other low-wage retail jobs may be similarly threatened. Hi guys, the articles written in this blog sites, these are truly amazing regarding people knowledge well. Being a user of a business broadband in Australia, I know that technology has really evolved into something that can bring a lot of disadvantages if used irresponsibly. For any businesses, making use of technology is a good thing, being able to use it responsibly is far more important. It's a great there's a fast food, it is a big help. hey this is Remarkable blog .. lots of information . Unbelievable work man!! Keep your heads high you probably did it. tenks friend for the info or content you created here, I sukali it. thank you for this article. i love eating in fast foods..
well it is better.. I should try this also..
in Japan it's automated when you order a food in a restaurant, amazing, right? of the future look like? This groundbreaking book by a Silicon Valley computer engineer and entrepreneur explores these questions and shows how accelerating technology is likely to have a highly disruptive influence on our economy in the near future—and may well already be a significant factor in the current global crisis. THE LIGHTS IN THE TUNNEL employs a powerful thought experiment to explore the economy of the future. 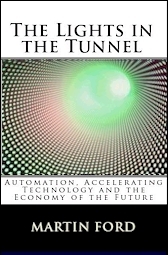 An imaginary "tunnel of lights" is used to visualize the economic implications of the new technologies that are likely to appear in the coming years and decades. The book directly challenges nearly all conventional views of the future and illuminates the danger that lies ahead if we do not plan for the impact of rapidly advancing technology. It also offers unique insights into how technology will intertwine with globalization to shape the twenty-first century and explores ways in which the economic realities of the future might be leveraged to drive prosperity and to address global challenges such as poverty and climate change. The author discusses the impact of robots and artificial intelligence on the TV show "Ideas in Action"